And when they do not make them look like us, we must make our own. I am my own legend. When we look in the mirror of fantasy and fiction and see our own faces staring back at us we can get through the day. To cope with my own life and societal oppression, I developed an imagination that cannot rest. I have spent my life playing pretend. I write stories on the bus, in the cafes, to songs on the dance floor, to rhythms of life and beyond. In my mind, I write the stories I want to see, but can’t because most stories were and are written for others. Usually White People. This is why I larp. I larp to create my own mythology, and to create space for stories with people who look like me to exist. 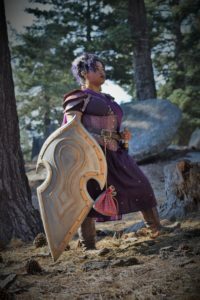 Larp is defined as live action roleplaying. There are many styles, but the basic premise is that it is live and happening right now, and you are pretending. Sometimes this means you are on a massive fantasy battlefield in plate armor, and other times it means you are literally crying alone in a closet. It’s all fun, it’s super rewarding, and it allows me to see myself in spaces that I don’t exist. There is no shame in live action roleplaying. I am a larper. I study larp. I write larps. I breathe larps. Some people point to various games as the first time they larped, but to me I have been larping my whole life. I have larped to lift the societal oppression that holds me underwater, hoping I’ll drown. This is my life in larp. 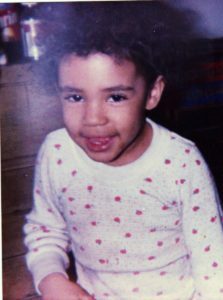 Me at three being hella cute. I was in the hospital, which is a place where healing happens, but it was also 1988, and AIDS had struck. One of my roommates was to become a casualty. She gave me her jello, and I gave her my scrambled eggs. We told stories and laughed between hospital beds, and we dreamed up places that weren’t the sterile rooms filled with all too knowing children. At night when the doctors and nurses whisper, I put on my earphones with their thin foam coverings and listen to Michael Jackson’s Bad album on repeat. I close my eyes, and pretend my headphones are magic, and they take me away from the machines that constantly beep, and the growing fear in my chest. I am a rock star with secret powers that help me to stop criminals. I am an ancient Queen, galloping across the land on a magic horse. I drive racecars, and go so fast that my car goes to outer space. In the cartoons, they heroes don’t look like me, but in my mind, they are all me, me, me. Then she was gone. I had to dream by myself. I am 8 years old and a prison guard is patting me down. I do not like this. I do not like prisons. They are a strange blue grey that will later make me look at the color in my crayon box and call it prison blue. My grandfather has taken me to see my father. My father is a good man, with bad habits. I was told prison was for people who murdered and hurt people, but the room I am in is filled with people like my Father. They are all mostly Black men who talk kindly to their children. They are all mostly here for non-violent crimes. I know this, because it is said a lot. My mother has dressed me in a nice dress with navy Mary Janes. I pretend that if I click them the prison guard will let my Father out. I give it a try. It does not work. Whenever I look down at my shoes, from then on out, I pretend they are magic. I pretend to have the power to save my family. Me at Hermione’s Age. I sincerely thought that she was the first fictional character who ever looked like me that I also identified with. Not pictured? My wicked glasses and over achiever nature. others. I am at a college level, and so during quiet reading periods I read Like Water for Chocolate while other kids read Number the Stars. Mrs. Needle says my book isn’t appropriate, and I have to read something else. She also tells me I cannot possibly understand it. It hurts, but from then on, I bring in Anne Rice and fantasy novels with switched covers. Also, I write. I write stories about anything and everything. Stories where all the heroes look like me. No heroes in books look like me. The people in Like Water for Chocolate looked like me, to me. I roped my little cousin into joining me for tours one year. Alexander Hamilton, and George Washington roamed. I don’t think about these men. I think about Betsy. Betsy is the woman I found on the list of the House’s slaves. She was 30 years old, and a housekeeper. 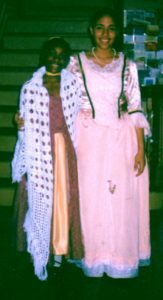 I think about what it must have been like to be Betsey, and I write a “living history” event[ii] for her which we premier. I get all dressed up, but I am embarrassed. What if no one wants to hear Betsey’s story? What if no one wants to hear my story? Why are there no stories about women like Betsey and me? I am 20 years old when my writing Professor’s wife at Williams College walks up to me and instead of introducing herself says, “Oh, you must be the tragic mulatto.” I blink my eyes several times. I wonder if her White husband has said this, or if she has decided to tell me this. 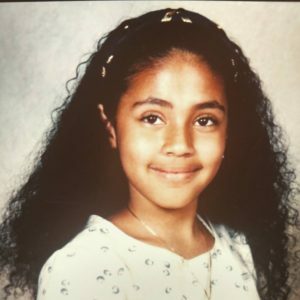 In her husband’s writing class, I write stories about women of color. Some like me, with multiple marginalized identities. They marry men who are from everywhere. Sometimes men aren’t involved. They don’t marry. Some make deals with the Fae. I haven’t written any of them to be tragic. There is ice in my heart, but don’t know what to say. I miss Paul Park’s class, where we read Octavia Butler and discuss the future instead of someone’s suburban marriage. Before A’isha came into her own, she was just a plucky half elven bard. I am 30 years old, and my friend Nox is trying to get me to play dress up in the woods. He reminds me of a man someone has charmed from the depths of a dream. Tall, handsome, and thin with elven features carved into a classic Bowie-esque face. We are all in his house filled with props, suits of armor, one massive clown, goblin puppets, skulls, and a deep comfortable love for his chosen family. He is also sweet and massively nerdy, and he tries to explain that larping is fun. I have a lifetime of lessons that say going into the woods with a large amount of White people who have weapons is probably not safe. Not even if some of them are my friends. It’s not that I don’t trust them, it’s just that I don’t know the other 100 people. Our friend Mike, who is usually the voice of reason, chimes in. He has been running our improvisational fantasy roleplaying show, Dungeon Master for who knows how many years, way before Nox or I ever came into the picture. Like Nox, he is not what they say nerds look like. Mike is built like he has always done sports. He looks All American solid, with vivid eyes and a ready laugh. Nerdy at heart, but not in appearance, he explains that there are other people of color, and that we will build a tavern from scratch. It will be fun. There were even people of color there. Women, even. A barrage of women of color, even. Women who looked like me. But it was more than that. I was the hero in a fantasy novel I always wanted to be. I was fighting with swords and shield, a dual wielding bard who took down her enemies and entranced audiences with story and song. And it didn’t stop there. I have lived untold fantastical lifetimes. I’ve been a 1930’s housemaid who became a costume designer. An anarchist Droid who led a revolution to a Janelle Monae soundtrack. I was a God of Failed social experiments who headed the Lost Causes department through encouragement. I was a brilliantly intense Regency era widow who protected her family and her love like a tiger, and probably would have ripped out throats. I was a vampire who burned down plantations and later dug the Goth scene. A wizard prodigy who combined her culture and her brilliance to save the day and ended up getting a family at the end. And I am most frequently A’isha Elvenhart a death loving bard with a legendary magical lute, a massive shield, a sword, and a penchant for grey hatted justice. And when recently, I posted photos of A’isha, my friends love and support filled my inbox. The characters I created were one’s people liked seeing. It had never clicked that people really enjoyed my creations. Or thought they were anything more than my own mythos making. My friend Simon asked, in all seriousness if he could make a poster of it and put it on his kid’s bedroom wall. A’isha now. Metal!Bard. Fighter, Lover, and total badass. I read the sentence dozens of times, shocked. The thought of being so badass that I could be a poster like all the posters I owned as a kid, that never featured anyone who remotely looked like me was a deeply moving moment. How could this possibly be something I created? But then I thought of myself, and I thought of the mythos that surrounded a woman who fought and sang and loved. She was all the fantasy novels I had ever read, and wanted to be. She was a bard of all ages, a warrior and unstoppable even in the face of certain death. She was my dream of me. I am my own mythos. I really am my own mythos. I play to achieve liberation from a society that tells me not to dream. We need to see ourselves. We need to see picture of us in the foreground, not the background. Just as important, is that *others* need to see us. We need to see women of color as heroes. We need to see folks who are gender fluid. We need to see folks who are trans. We need to see the world as it is, and not what we have been told. With larp, I am the star of my own private novel, and others there are the stars of their own. With my larp academia I have visited 5 countries. A third year wizard prodigy fond of artificiery, African religions, and vogue. Banji Babe Wizard Realness. Written 3 larps. One of which will be available in the #feminism reprint. Given a workshop on how to create simple larps for preschool children at Knutepunkt 2017. Taught Romanian larpers how to integrate childhood education into their ecological larp park. Volunteered behind the scenes at Dziobak’s massive wizard larp, College of Wizardry, which takes place in an actual castle. Wrote the first of many larp autoethnographies. 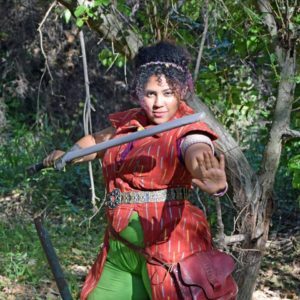 Wrote an article on nordiclarp.org and coined the term I’m dealing with in my thesis, emancipatory bleed. I’ll be speaking on a panel at Gen Con 50 that will hopefully help folks chat about creating diverse universes with gaming. I’ll also be volunteering with Learn Larp, whose amazing larp, New World Magischola, is a study in research and respect. I got to play Celestine Deruze, someone who became the badass wizard I saw for myself when I read the Potter books. Oh, and I finished my first year of graduate school with all A’s. I have never felt more satisfied in my chosen field than ever before. Seeing people use larp to heal themselves and create stories they so desperately need to see, is one of the most satisfying feelings in the world. [i] This is what the nurses and the doctors say when they think I can’t hear them. People expect toddlers to not remember, but I accurately remember understanding what death meant. Your toddlers remember more than you think. [ii] This is most certainly a type of educational larping. Thanks for your voice! Just listened to you on Backstory. Did I hear correctly that you’re in LA? Have you been to Strategicon? FYI, I’ve been running RPG Games on Demand there on Saturdays for the last year, and I really would like more folks coming with short-form LARPs (like Ghost Court, or found in #Feminism, or found in The Gauntlet’s Codex, etc.). Anyways, if you ever plan on going out, let me know. Or if you plan on running a LARP there, I’d be happy to drum up some participation (assuming you need any).